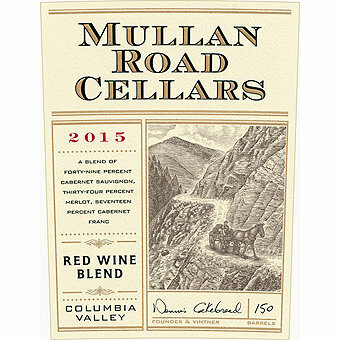 Founded in 2012 by Dennis Cakebread, Mullan Road is a first rate Columbia Valley Red! Mullan Road Cellars is a project led by Dennis Cakebread of Cakebread Cellars to produce first class wines from the unique microclimates of Washington State. Drawn by the high quality of wines coming out of the Walla Walla, Dennis and winemaker Aryn Morell worked with the famed Seven Hills Vineyard on the southern edge of the Walla Walla Valley appellation as well as vineyards in the soon-to-be-recognized Royal Slope appellation to craft this powerful yet elegant Bordeaux-style Red Blend 49% Cabernet Sauvignon, 34% Merlot, 17% Cabernet Franc and 3% Malbec. The wine was fermented in a mix of concrete tanks and stainless steel, and aged 18 months in 30% new French and American oak. It received a gold Medal in the San Francisco Chronicle Wine Competition and the Wine Advocate scored this 94 points saying "The 2015 Columbia Valley Red Wine opens in the glass with aromas of cassis, plums, sweet spices and burning embers. On the palate, it's medium to full-bodied, deep and layered, with lovely concentration, an abundance of fine-grained tannins and a pure, penetrating finish. A blend of 49% Cabernet Sauvignon, 34% Merlot and 17% Cabernet Franc, 3,570 cases of this excellent red were produced."